On September 15, 2018, Typhoon Mangkhut, locally named Ompong, killed several people in Itogon, Benguet. On September 22, 2018, Igorot mixed martial arts star Joshua “The Passion” Pacio, 22, was crowned the new ONE Strawweight World Champion “ONE: Conquest of Heroes” and dedicated his victory to the victims of the typhoon. Representing Team Lakay of Baguio City, Philippines, Pacio had his rematch with Yoshitaka “Nobita” Naito, 34, of Matsudo, Chiba, Japan in the main event of “ONE: Conquest of Heroes” at the Jakarta Convention Center in Jakarta, Indonesia. The Team Lakay warrior won via unanimous decision, earning his seventh victory in ONE Championship. 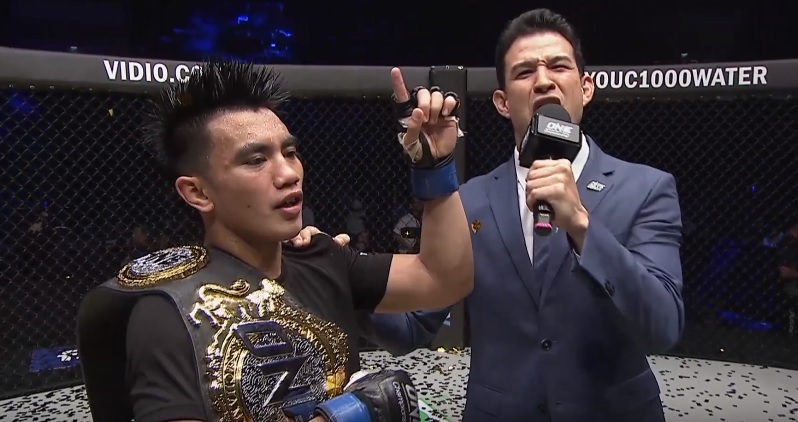 It was the third world championship win in 2018 for Team Lakay, as Pacio joined the likes of reigning ONE Interim Bantamweight World Champion Kevin Belingon and undisputed ONE Flyweight World Champion Geje Eustaquio.